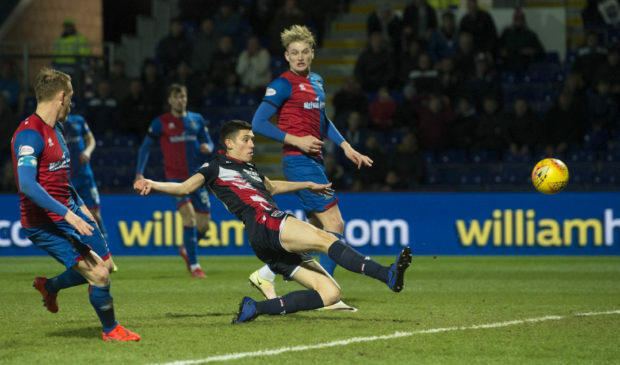 Ross County forward Ross Stewart has urged the Staggies not to get carried away in their pursuit of a Scottish Cup semi final berth at Hampden Park. County will take on Highland rivals Inverness in a last-16 replay at Caledonian Stadium next Tuesday, following the sides’ 2-2 draw at Dingwall on Monday. Should Steven Ferguson and Stuart Kettlewell’s men progress, their reward will be an all-Championship quarter final tie away to Dundee United, however Stewart is wary of looking too far ahead as the Staggies dream of a first national stadium outing since their League Cup final victory over Hibernian in 2016. Stewart said: “With it being another team from our league, Dundee United, hopefully we can get through. “But we don’t want to look too far ahead because it is going to be a really tough replay against Inverness. “It will be another good advert for the Championship, with one in the semi final now regardless of what happens. Stewart netted to make it 1-1 within 60 seconds of being introduced as a substitute against Inverness on Monday, and having netted the winner in the sides’ previous league meeting in December, the 22-year-old hopes his derby goalscoring habit continues. He added: “The manager just told me to go on and bring energy to the game – get myself a goal. Being a striker, you’re always trying to get yourself into the box and Midge has put in a great ball. “Let’s hope my own derby impact continues. That’s obviously twice in a row I’ve scored in them. County’s focus switches to Friday’s IRN-BRU Cup semi final tie at home to East Fife, with the Staggies aiming to set up a final against Welsh side Connah’s Quay Nomads or League 2 side Edinburgh City. Former St Mirren player Stewart added: “The games are coming thick and fast. It’s a tough schedule but that’s why we have a squad of such depth here – really good quality that can come off the bench and change games like on Monday. “I’m sure the managers will be using everybody with all the midweek fixtures coming up.